K.O. standing in front of Gar’s Bodega. The first season of Ian Jones-Quartey’s OK K.O.! Let’s Be Heroes was a surprisingly charming introduction to a madcap world inhabited by superheroes, villains, demons, aliens, and one earnest little boy who just wants to become the best hero there ever was. Much in the same way that Steven Universe’s earliest episodes were largely focused on building out the world and its character’s personalities, OK K.O. began somewhat small (though hyper-detailed) in focus in a way that felt right. 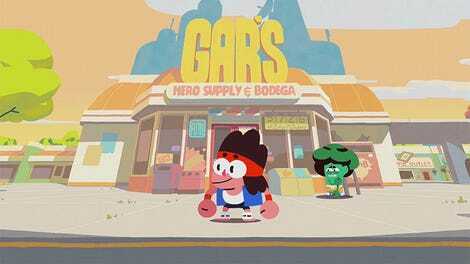 In each of their random adventures, you got to learn something new and important about K.O., his mother Carol, friends Enid and Rad, and all of the other characters that inhabit Lakewood Plaza. 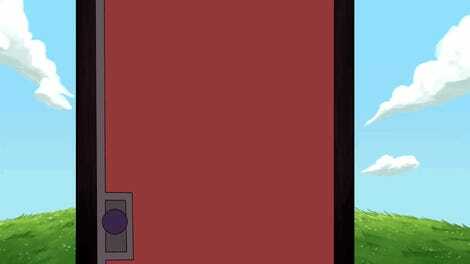 That gradual fleshing out of OK K.O.’s world made the first season’s finale, in which K.O.—a terminally-Sweet Boy™—is forced to face off against T.K.O., his violent id, who reveals things about their personality that shakes K.O. to his core. K.O.’s showdown with T.K.O. signaled that the series was on the verge of making a significant change in tone going forward. As the first half of the second season has been playing out over the past few weeks, the story’s definitely become more complex and decidedly more serious, but it still has all the heart that first made the series so captivating. Change is the largest overarching theme to most of OK K.O.’s second season, and its first entry, “Seasons Change,” turns the idea into an episode that’s more of a statement than anything else. When K.O. meets up with Rad and Enid after a long summer vacation, he’s dismayed to see that they’ve both gone through drastic physical and personality changes. K.O.’s difficulty accepting that his friends are going through changes is very much in line with his sometimes childish behavior. But as the episode plays out and K.O. comes to begrudgingly accept that his friends, different though they may be, are still people he cares about, “Seasons Change” begins to telegraph the kind of emotional arcs that make up the rest of the season. Though Enid and Rad’s new guises as a mime and orange surfer bro don’t last, their new dynamics with K.O. do to varying degrees, and they reveal interesting things about who they all are as people. When the trio decide to enter a short film in a local competition, the stakes bring out their inner scathing critics which make them question their relationships with art and their friends. 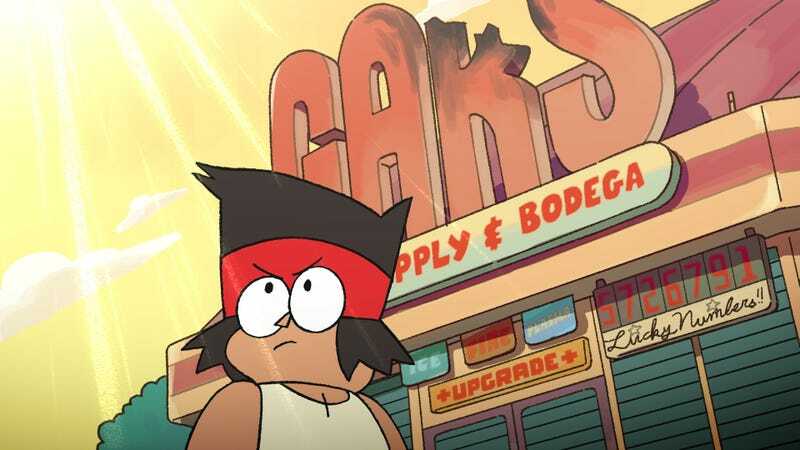 Mr. Gar, K.O.’s boss, begins dating K.O.’s mother at the beginning of the season—and though it isn’t immediately a huge deal, K.O. struggles to cope with the idea of her being with a man who isn’t his father. OK K.O. explores these things with its signature action-packed adventures that lovingly poke fun at Saturday morning superhero cartoons, but at the same time, it’s also building out an emotional depth to the series that feels distinct and new. In “Your World is an Illusion,” K.O. meets Holo-Jane, a holographic hero with the ability to see and move through the space between realities and break the fourth wall. 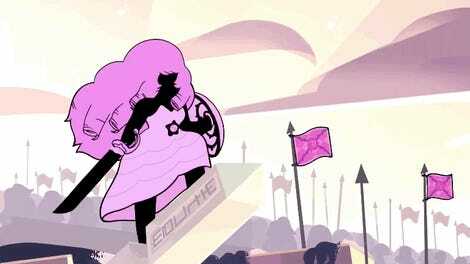 Throughout the episode, she reveals to K.O. that they’re only cartoon characters whose actions are dictated by the people who create the television show, and K.O. understandably falls into an existential depression. But rather than using the conceit to wink and nod at the audience about the television production process, “Your World is an Illusion” instead turns inward and challenges the idea that relationships can’t have meaning just because they’re fictional. As heavy as OK K.O.’s second season gets at multiple points, there are more than enough moments of levity to balance things out and keep them in perspective. For instance, P.O.I.N.T. (a blatant S.H.I.E.L.D. parody organization) makes its triumphant return in an episode that takes a few jabs at comic book movies. What’s really most impressive about the direction OK K.O. is taking is that all of this new narrative steam and clarity is all just from the first half of the season. The show’s taken its characters to new places in ways that set the groundwork for an even deeper, more emotionally satisfying story going forward. All there’s left to do now is wait until OK K.O. returns in July.